If you ask me to name only one blogger whose style I admire the most, I would not hesitate when I answer. True, there are so many bloggers out there that inspire me, but the one that can literally do no wrong in my eyes, the one who’s effortless style and class never ceases to amaze me is Erica Hoida from FashionedChic. 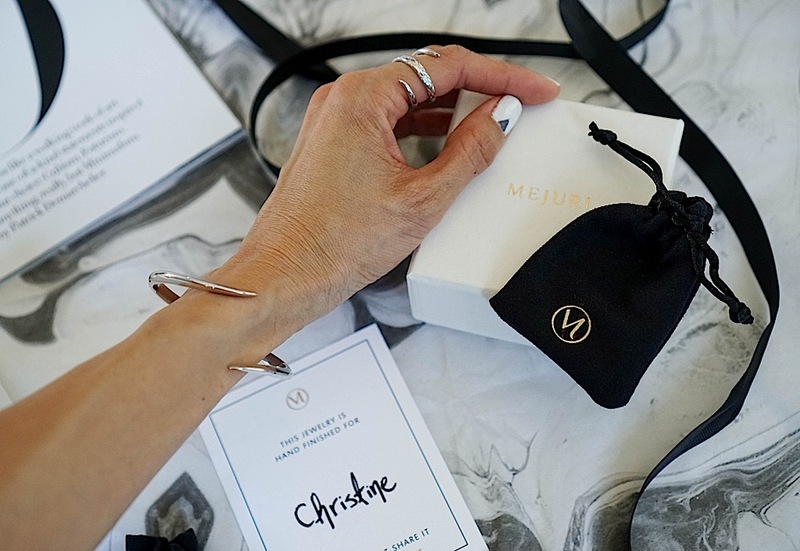 So when Erica Hoida, my favorite stylist/ blogger, designs jewelry with one of my favorite jewelry brands, Mejuri, there is no question about it. I want it, I need it, it has to be mine. The line is simple because it doesn’t need to be complicated – one ring, one cuff, and one pair of ear jackets all in 925 sterling silver. I am typically not a silver jewelry person, but the edginess of this collection draws me to its pieces. The collection is titled “Dare” because takes classic pieces and elevates them to a modern edge. The sleek, razor edge curves of each piece wrap organically around your body and the ring features additional etchings inspired by Erica Hoida’s animalistic nature. Not only do I love Mejuri for their quality and affordable prices, but I also love their customer service. 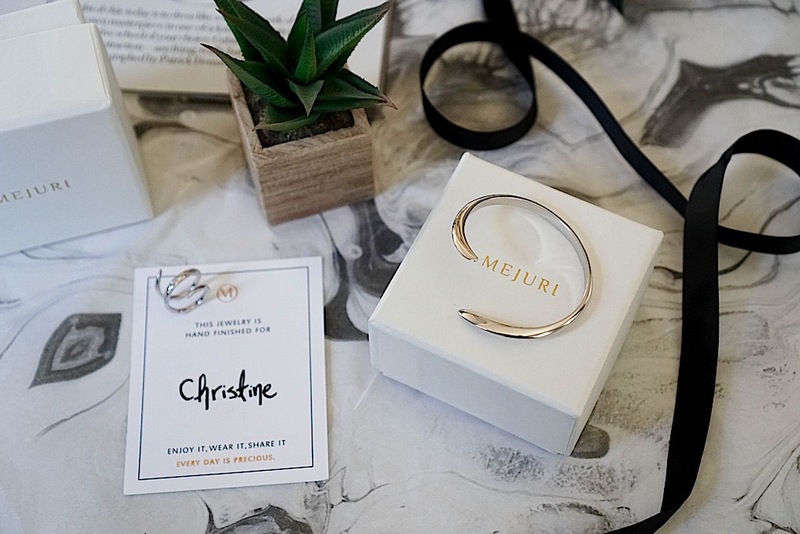 Knowing your ring size or ordering jewelry from a website can be tricky sometimes, but emailing Mejuri gets you an answer right away (it’s like they don’t sleep over there!). 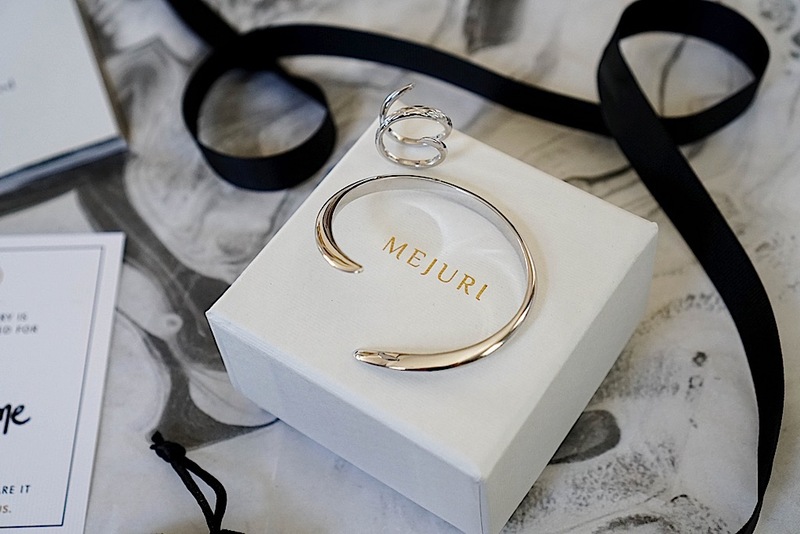 Mejuri items are delivered quickly and delicately wrapped with each piece in its own black jewelry pouch. One of the best parts of opening the package is seeing the little card which has your name handwritten on the note (talk about personalization). So go on, check out these beautiful pieces, I “DARE” you, because you won’t be disappointed. Thank you Mejuri for sponsoring this post. All opinions and thoughts are my own. Such gorgeous pieces! I love the subtle wrap around effect, it’s so elegant and versatile! I also love your nail design, too! Thanks so much for sharing, beautiful, and I hope you have the most amazing weekend ahead! Thank you Jalisa. These pieces are so modern and elegant and I just fell in love. Not to mention I adore Erica Hoida’s style. Hope you have a great weekend too! who makes and where can we buy your sunnies?! Thanks Sharon! I love this modern style and the best thing is that it fits me (ring and bracelet)! It’s hard to find pieces, especially rings, that fit our fingers, but Mejuri does a great job of customizing too. But this set didn’t even need to be made smaller! Have a wonderful weekend too! Absolutely love these jewels, super beautiful! Thank you Sia! Aren’t they edgy yet feminine and minimal? Love this collection! I have bundles of love for the photography in this post! The bangle is really special and I love its fierce design – it reminds me of a serpent wrapped around the wrist, very cool! Thank you so much Gabrielle! 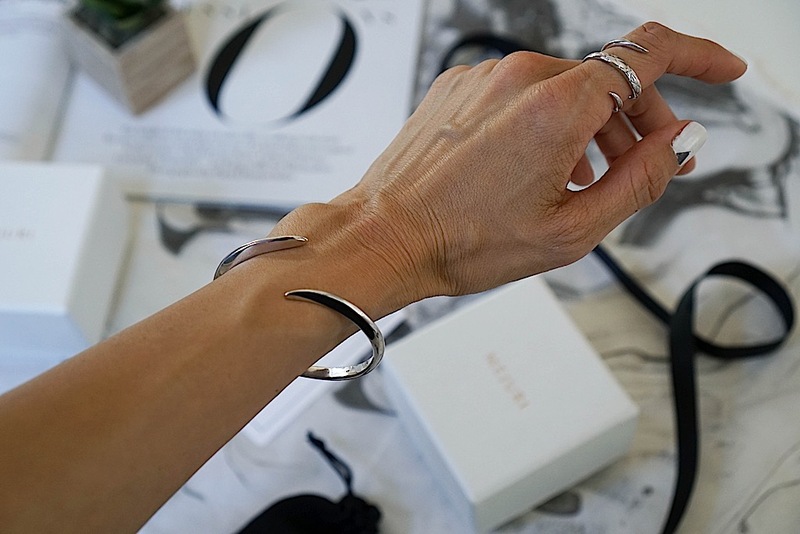 Yes, the bangle is very sleek and edgy. Reminds me of some Tiffany & Co. pieces but more modern. Such a stunning piece! I love it!! Thank you Adi. They are really, stunning pieces of art. I love pieces like these, I wouldn’t have known about them if I hadn’t stopped by! Beautiful jewels! I love Mejuri! Isn’t Mejuri the best? They make such amazing yet timeless pieces! These pieces are so gorgeous and unique! I love the style of the wrap-around feel it gives off! Thanks Jenn! Yes they are so elegant and pretty! Such a chic and slimming bracelet! Thank you Jessi! It’s my new favorite bracelet! So so pretty! Love your Chanel too! Thank you Filipa! I hope you had an amazing weekend! Lovely post and I agree with how awesome Erica is! So cool you got to check out her collaboration with Mejuri. Gorgeous pieces! Isn’t she, I am in love with her effortless style. Thanks Sydney! What a lovely piece of jewelry. It is very simple yet elegant and looks wonderful on you! I agree, these pieces are very subtle and refined Carmen! Absolutely love these bangle! Super nice! Thank you Katrina! Isn’t the style so lovely? Thank you Nina, they are definitely one of my favorite pieces indeed. Such a unique and bold statement look. Love it, Christine! Thank you Kate. It is definitely a bold, but understated collection which is so me! I love your new jewelry. So simple, yet different. Beautiful! Thanks Miki, I am in love with this collection too! Those pieces are seriously stunning, especially the bangle! 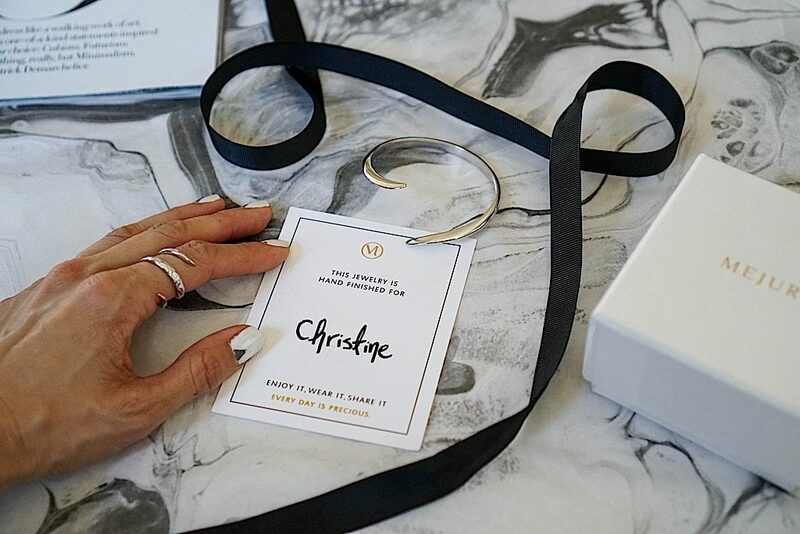 Love it, Christine! Something so elegant and minimal about this collection that makes it alluring, right? Beautiful pieces of jewelleries ! Thank you Margot, aren’t they just so pretty and perfect? Every day pieces that are timeless!